Pension Reform and Income Security New! Japan Pensioners’ Union (JPU) is one of the leading organizations of older persons in Japan. JPU has strove to defend older persons’ lives and rights. JPU has fought against governmental policies which have successively given heavier burdens to older persons and fought for better pension systems in Japan. JPU was established on August 30, 1989, starting with 12,696 members, 24 prefectures’ committees, and 284 branches. Now, it consists of over 64,000 members, 700 branches and 47 prefectural headquarters, which promote actions in accordance with the central headquarter in Tokyo. JPU is affiliated with the National Confederation of Trade Unions (Zenroren), and cooperate with workers in Japan. 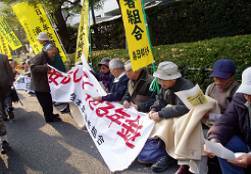 In Japan pension reform is one of the major social and political issues now. The government is going to reform the public pension systems, revising the pension laws in the coming regular session of the Diet. JPU has worked on signature campaigns for the petition against the reform, in which the higher premiums for workers and lower benefits for retired persons are going to be forced. We need the reform for the better, not for the worse. JPU is advocating a national minimum pension scheme funded by the national treasury. JPU is making every effort on organizing older persons who are most likely tobe isolated in community. It is also putting effort on making older persons happy by promoting cultural and recreational activities. Japan has two types of public pension schemes: the National Pension Scheme, which apply to all the people in Japan as a basic pension, and the Employees’ Pension Schemes, whose benefits are added as additional pensions for employees. Beside the Employees’ Pension Insurance Scheme for general employees, there is the Mutual Aid Pension Scheme for national and local public service employees, teachers and others. Public pension schemes are supposed to apply to every Japanese and to be main income for older people. Although average Employees’ Pension for men is about 190,000 yen (US$1540), however, it is only 110,000 yen for women. Furthermore, the average benefit of the National Pension Scheme is 45,000 yen, and that is all that 46% of the pension recipients are paid. It is hardly enough to support older people’s lives. Public Pension Schemes are rapidly becoming “hollow” inside. The contributions for the National Pension Schemes are so high that more and more people are getting unable to pay them, and these people are likely to get no pensions in their old ages. The situation that more and more workers, especially young people, are getting unstable and temporary jobs also affects the pension schemes adversely. As successive pension reforms in recent years have made the benefit worse and the contribution higher, young people are losing reliance on the pension scheme itself. We advocate that the government should establish the national minimum pension scheme that should provide the adequate pension for every citizen without contribution. Employees’ pension schemes should be put on it as additional pensions. Financial resources for this scheme should be found first by rearranging the government budget, fifty trillion yen of which is yearly used for the public works, while only twenty trillion yen is used for social security. Secondly public pension schemes have already accumulated the fund of 190 trillion yen. We claim this fund should be phased in to support the national pension scheme. The urgent reform to make the government contribution for the National Pension Scheme half instead of one-third in the current system is also necessary. JPU will put every effort to realize this reform. The constitution of Japan provides that every citizen should be respected as an individual and should have rights to live in peace. We, the members of All Japan Pensioners' Union, try our best to observe the idea of the constitution and develop it. We aim to make a society in which older people will be able to live in abundance and in freedom. Our organization is open to all citizens including younger people, and we unite to take actions for our purpose disregarding different creeds and beliefs. and will create happy old ages sound in mind and body. ( 2) We will do our best to establish social security systems based on the responsibility of the corporations as well as the government, which include proper pension schemes, medical care systems, old age care and welfare systems. They will guarantee healthy and cultural lives in old age. ( 3) We will promote various activities based on local areas across Japan. ( 4) We will act in collaboration with labor unions and organizations with the same purpose, and also with individuals, workers and older people in the world. ( 5) We will make Japan a peace-loving and neutral country without nuclear weapons. We will leave the beautiful earth to our descendents. We try our best to democratize Japanese politics, economy, education and culture. ( 6) We will try our best for Japan to make the democratic progress in politics,Economy, education and culture. Japan has two types of public pension schemes: the National Pension Scheme, which apply to all the people in Japan as a basic pension, and the Employees' Pension Schemes, whose benefits are added as additional pensions. The Employees' Pension Schemes include the Employees' Pension Insurance Scheme for general employees, and the Mutual Aid Pension Scheme for national and local public service employees, teachers and others. Public pension schemes are supposed to apply to every Japanese and to be main income for older people. Although average Employees' Pension for men is about 200,000 yen ($2000), however, it is only 110,000 yen for women. Furthermore, the average benefit of the National Pension Scheme is 45,000 yen, and that is all that 46% of the pension recipients get. It is hardly enough to support older people's lives. Public Pension Schemes are rapidly becoming "hollow" inside. The contributions for the National Pension Schemes are so high that more and more people are getting unable to pay them, and they are likely to get no pensions in their old ages. The situation that more and more workers, especially young people, are getting unstable and temporary jobs also affects the pension schemes adversely. As successive pension reforms in recent years have made the benefit worse and the contribution higher, young people are losing reliance on the pension scheme itself. We advocate that the government should establish the national minimum pension scheme which provides the adequate pension for every citizen without contribution. Employees' pension schemes should be put on it as additional pensions. Financial resources for this scheme should be found first by rearranging the government budget, fifty trillion yen of which is yearly used for the public works, while only twenty trillion yen is used for social security. Secondly public pension schemes have already accumulated the fund of 180 trillion yen. We claim this fund should be phased in to support the national minimum pension scheme.